"Django Unchained" feels oh-so-familiar and yet oh-so-different from a typical Tarantino film. At its core, all the elements we expect from Quentin Tarantino are there: unabashed gore, violence and language, seriously irresponsible and unconventional - and yes, even a cameo from the director himself. But "Django Unchained" differs itself from all the others seemingly by coming out as Tarantino's most refined work yet. 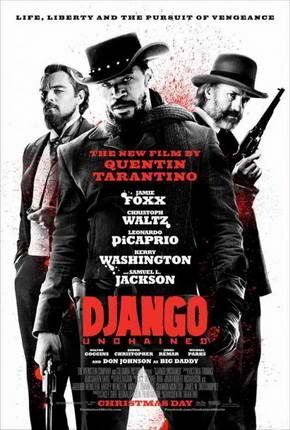 Django (Jamie Foxx), a slave whose brutal history with his former owners lands him face-to-face with German-born bounty hunter Dr. King Schultz (Christoph Waltz). Schultz is on the trail of the murderous Brittle brothers and only Django can lead him to his bounty. The unorthodox Schultz acquires Django with a promise to free him upon the capture of the Brittles – dead or alive. Success leads Schultz to free Django, though the two men choose not to go their separate ways. Instead, Schultz seeks out the South’s most wanted criminals with Django by his side. Honing vital hunting skills, Django remains focused on one goal: finding and rescuing Broomhilda (Kerry Washington), the wife he lost to the slave trade long ago. "Django Unchained" is put simply, unbridled fun. Forget historical accuracy or realism because those things take a back seat. From the first scene where Dr. Schultz amusingly frees Django from a bout of slavery, you know you are in for an unforgettable ride. To be honest, everything works for "Django Unchained". The acting in particular is of special note and Christoph Waltz still amazes us on how perfect he is with his character's nuances. There's just something about the guy and eccentricity that works. The plot as well proves to be interesting from start to finish and nary a boring/slow moment. Tarantino takes a different approach with a more or less linear development and it makes the film feel and move fast. Considering that this is almost a 3 hour film, time actually flies by. Finally, the extreme violence, uber gore and unwarranted language is all in here wrapped nicely for everyone to see, hear and experience - making one heck of an entertaining film from first to last scene.